You know what won't be mentioned in the State of the Union? The drawing implies that the African Black Rhinoceros is the reason why the US Government owes its creditors $22 Trillion. Why does the Tribune Creepy Cartoonist bear this sort of ill will against critically endangered African mega-fauna? A large animal like a rhino would be a convenient choice for symbolizing something as big as $22 Trillion. But there are other African mammals that could just as easily represent the enormous national debt. The elephant weighs more than two times the rhinoceros and can consume 300 lbs of food per day -- again more than twice the rhino. 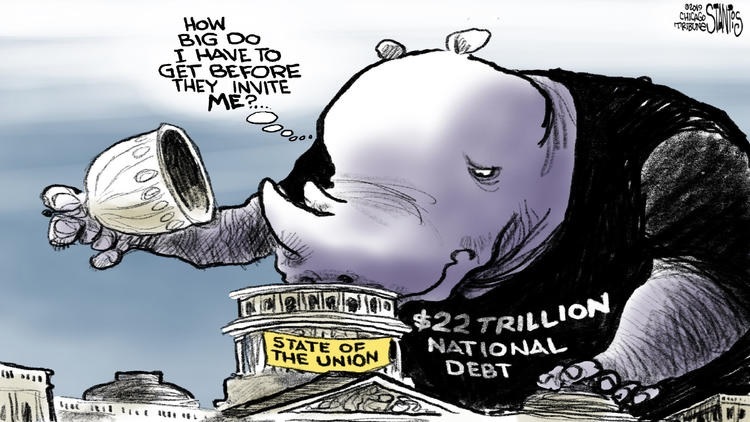 But your LakeCountyEye has never seen the Creepy Tribune Cartoonist use an elephant to symbolize the national debt. Why not? The elephant would be a good choice to illustrate other national concerns as well. Like government corruption. Has the Creepy Tribune Cartoonist ever chosen an elephant to depict the scandals at the highest level of the US Government now under investigation? Your LakeCountyEye does not think so. And what about Climate Change and Gun Violence and the high cost of Health Care? Has the Creepy Chicago Tribune Cartoonist ever symbolized any of these with the picture of an elephant? No, No and No. Is there something obvious that your LakeCountyEye is missing?